Ernest Hemingway On Hunting: Ernest Hemingway’s lifelong zeal for the hunting life is reflected in his masterful works of fiction, from his famous account of an African safari in “The Short Happy Life of Francis Macomber” to passages about duck hunting in Across the River and Into the Trees. 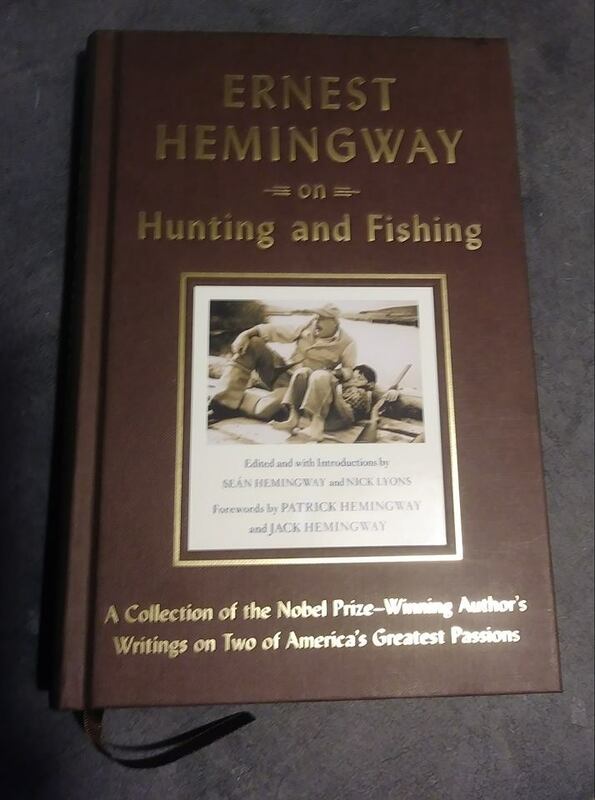 For Hemingway, hunting was more than just a passion; it was a means through which to explore our humanity and man’s relationship to nature. Courage, awe, respect, precision, patience—these were the virtues that Hemingway honored in the hunter, and his ability to translate these qualities into prose has produced some of the strongest accounts of sportsmanship of all time. Ernest Hemingway On Fishing: From childhood on, Ernest Hemingway was a passionate fisherman. He fished the lakes and creeks near the family’s summer home at Walloon Lake, Michigan, and his first stories and reportages were often about his favorite sport. Here, collected for the first time in one volume, are all of his great writings about the many kinds of fishing he did—from trout in the rivers of northern Michigan to marlin in the Gulf Stream. In A Moveable Feast, Hemingway speaks of sitting in a café in Paris and writing about what he knew best—and when it came time to stop, he “did not want to leave the river.” The story was the unforgettable classic, “Big Two-Hearted River,” and from its first words we do not want to leave the river either. He also wrote articles for the Toronto Star on fishing in Canada and Europe and, later, articles for Esquire about his growing passion for big-game fishing. His last books, The Old Man and the Sea and Islands in the Stream, celebrate his vast knowledge of the ocean and his affection for its great denizens. Hemingway on Fishing is an encompassing, diverse, and fascinating collection. From the early Nick Adams stories and the memorable chapters on fishing the Irati River in The Sun Also Rises to such late novels as Islands in the Stream, this collection traces the evolution of a great writer’s passion; the range of his interests; the sure use he made of fishing, transforming it into the stuff of great literature. Anglers and lovers of great writing alike will welcome this important collection.